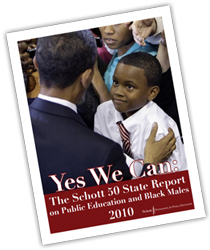 Less than half of black males–47%–graduated from high school in the 2007-08 academic year, according to “Yes We Can: The 2010 Schott 50 State Report on Black Males in Public Education,” a new report from the Schott Foundation for Public Education. The report gives a state-by-state look at which U.S. school districts and states. It concludes that without targeted investments to provide the core, evidence-based resources to help Black male students succeed in public education, they are being set up to fail. The report’s Massachusetts evaluation shows that even though the state has a graduation rate for black students higher than the national average, the graduation rate for black males is 52% compared to 78% of white males. In Boston, the graduation rates are lower, with 47% of black male students and 60% of white male students graduating from high school in 2007-08. Boston and Massachusetts as a whole both showed slight improvement from the 2005-06 academic year data. The states with black male student enrollment exceeding 100,000 that have the highest graduation rates for black male students are New Jersey (69%), Maryland (55%), California (54%) and Pennsylvania (53%).